Draconian Norns, converted to the TCB genome. Just like the originals they are long lived, slow aging carnivores who are extremely fragile while young but tough as adults. They start out eating bugs and sometimes pests (though stingers are risky for babies) then may transition onto critters as they get older. Although this breed is resistant to spikes in temperature, they are very sensitive to the cold, so be sure to set up Heatlamps and Steam Rocks if needed! Due to the social nature of this breed, a new brain tract has been added to make colony life more peaceful. Also included are alternate sprites that give the Draconian Norns wyvern-like wings, because C3/DS was sorely lacking in wyverns! The pack comes with egg agents and optional replacers that work with the C1 hatchery and Grendel mother, no sprites are included. So what are the TWB/TCB genomes? The TWB/TCB genomes aim to expand upon the biology of Creatures by adding an internal body temperature, better sensitivity to the environment and a number of other additions including an overhauled immune system, fixed hunger system and breath holding ability. More in-depth information can be found here and here. What has changed in version 2.5? * The genomes are now more expressive. Creatures will look sad when they start to starve, allowing players to tell at a glance if their Norns need any help from them. * Improved resilience! All Creatures get a small improvement to their wound healing abilities, but aggressive breeds such as Hardman Norns and Banshee Grendels get a particularly large boost. * Portal pushing instincts have been strengthened, ready for use with the Albian Warp. * More tweaks to reduce the annoying clumping behavior. * A small brain edit has been added which reduces the aversion Creatures feel towards eating things that they cannot smell. Creatures should now have no problem eating things such as potions, manky, bugs, critters, animal eggs and detritus, though they will still favor more stimulating meals. * In addition to the above edit, the Toxic Norns have been re-balanced to require detritus in their diets, as they should now continue to eat it throughout their lives. Released for the 2015 CCSF, these creatures have the standard evo genome but with the colortrue edits applied. These creatures have different colors. I included the colors of the rainbow along with black, white, grey, and 128-across-the-board unpigmented. These are the Delft Norns, but with wings! This is a starter pair, so you might need to be careful when importing these to make sure they breed. Requires Bengal and Zebra Sprites. Also requires the Bengal Wingy sprite mod to be installed in Norn slot B - see the website link for details. There can be a problem with the normal Civet norns if the Bengal Wingies are installed.Civets don't come with their own body data but use body data from the next lowest slot.Which is the Bengal Wingies.To avoid "flying" civet arms.Install the Civet Wingies or download AngelNekos "Original Civet Body Data". 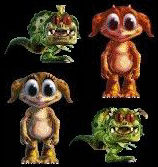 The BlackBerry norns were originally called "Black and Tan" norns.It was a "goodbye present to the community" from MK-Grendel before he had left the community.The sprites were'nt finished,but sprites for baby and youth existed.Alien decided to add the missing stages under his project. 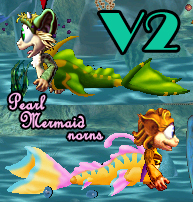 These norns have two genus genes, one for grendels and one for norns, subsequently half of their children will be grendels. Only half of their children can then produce the opposite genus as offspring, the other half are pure norns or pure grendels. A pack containing the two official Grendel breeds updated to the TCB genome (an accompaniment of the TWB genome with a few changes + fixes) along with a third new breed - Uglee Grendels! Uglee Grendels use the same sprites as Basilisk Norns, and unlike their more aggressive relatives don't go out actively seeking a fight; but Hardman Norns beware, although Uglees don't start fights, they are more than willing to finish them! Due to the cold blooded nature of these breeds, it's important to have the C3 weather patch before using them on the Ark, as vanilla C3 is much too cold for them! The Wrong Banshee has finally decided to sequence the genome of her faithful assistant 'Drascel', and is releasing the blueprints for any Shee or Banshee to enjoy! Though they appear fearsome, the "Basilisks" as she calls them (she really doesn't know anything about Basilisks, other than the fact they're big reptiles and... like to bask? I mean, it's in the name right? Bask-ilisks?) are actually quite docile and have exceptionally thick hides. They hardly bat an eye at the assaults of Grendels or other aggressive breeds, and in fact cannot feel pain at all. It is perhaps ironic then, that when exposed to positive interaction these Creatures react with fear and will often run away from their "attackers" as though their very lives were threatened... by a mere kisspop on the cheek! Other idiosyncrasies of the breed stem from their origin - the splicing together of an Ettin, an uglee and a tea leaf. Genetically they are most similar to Ettins with a lack of a fight-or-flight drive, an inability to feel heat and a particular love for gadgets. This coupled with their uglee genes make them very adapted to the desert. Other traits from the uglee include an exceptionally long lifespan, a penchant for animal eggs and cold-blooded anatomy. Being cold blooded, Basilisks have a slowed metabolism and are very sensitive to the temperature of their surroundings. For best care, it's advised to place a heatlamp (agent included, coding by Pilla) somewhere close by and set it to a toasty 8 or 9 along with the familiar scent of the Ettin desert. The tea leaf is an oddity, but this is where the Basilisks get their scent from! It has also imbued a couple of odd quirks into them such as tiny roots at the bottom of their feet, and chloroplasts under their scales. Their ability to photosynthesize is rather minimal, but it does allow for a small boost if there's enough water around. Breeding of these Creatures is difficult, but possible. Basilisks will only start to become interested in each other in the later stages of their lives, and even then might not know quite what to do. Crossbreeding is also possible, but comes with a lot of risks. If crossbreeding is attempted, it's best to use TWBs as they are genetically the closest to these Creatures. Now without further ado, please enjoy! A conversion of Studz's breed for Creatures 2. They are a short squat lizard-like grendel breed. Based on another breed which is a version of the original Creatures 2 breed, but with grey fur. This version is very tiny, and remains so. Semi-invisible norns, only their heads and hands are visible. They will stay small forever, and they are immortal. Tiny, santa's little helpers based on santa norns. They are cute little guys that never grow.